Last month I had the pleasure of attending the IV Complementary Currency Conference in Barcelona, Spain. The conference has been running biannually for the last eight years. Although this was my first, it was obvious that cryptocurrencies were a large part of the agenda, which I was informed was not the case in previous years. The following article will outline the different approaches for maintaining an alternative currency, including the opportunities afforded by Distributed Ledger Technology. Complementary currencies have a range of objectives, structures and implications. They are evident around the world, with many developing among progressive populations, or within crisis-hit communities. The most simple are notes of paper being distributed locally, often with signatures or serial numbers to indicate authenticity. They can be “backed” one-for-one with a unit of fiat currency sitting in a bank account somewhere, or may literally have no official value. These may seem strange to those in relatively stable economies, I have outlined my thoughts on the theories of value associated with them in this blog. They are surprisingly common around the world. The conference highlighted the growth of these types of currency schemes and also the underlying issues with value. Taking more developed world “progressive” schemes, they usually operate by printing a local version of a national or international currency. The UK has Bristol, Brixton and Totnes Pounds. They also use digital currency platforms, like Cyclos, where a central issuer provides a certain amount that circulate using smartphone applications or text message payment processes. The paper notes are a novelty, but only work because users know they can convert them back for traditional currencies. The digital versions are only as strong as the organisation managing the platform. There is no actual inherent limit to them, a malicious issuer could in theory print a million for themselves, without the community of users becoming aware of them. The innovation within this space should not be underestimated, there are so amazing examples of local currencies around the word. There are also so very interesting uses of digital currencies to issue credit for companies to expand, an example of this is the Sardex scheme in Sardinia, Italy. As a blockchain and cryptocurrency advocate, I initially believed that DLT could significantly disrupt this space. This was echoed with conference, as there were a couple of presentations offering blockchain solutions to communities. There was a very interesting presentation on the Bancor platform, which just completed the largest ever Initial Coin Offering. This platform provides practitioners with limited technical skills, all the features needed to issue their own blockchain-supported currency. An approach highlighted is that a community could issue a number of currency tokens based on value in reserve on the Bancor platform. This value is in Ether, the Ethereum token, which this kind of approach is usually referred to a “sidechain”. So a simple example is that a community could put 10 Ethers into the Bancor platform and issue a 1000 Community Credits, each backed by 0.01 Ethers each. These Community Credits could then be used to purchase local goods and services. Each time a transaction is made, the sidechain updates, which in turn is confirmed by the Ethereum platform. 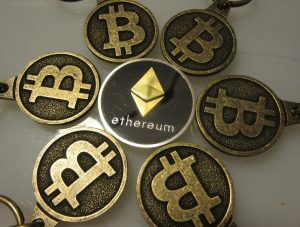 However, the value of the coins would fluctuate with the price of Ether, which may make buying things a little complicated. Another solution offered to communities was by Blockstream, who highlighted that their open source element platform could offer a blockchain-backed currency. So, a simple example of this approach is a community could download a blockchain-backed currency similar to the structure of Bitcoin. The system would mine 21 million Community Credits over its lifetime and these credits would have a value which would ultimately be open to interpretation by the community. This kind of system would however need mining infrastructure, so servers running to process transactions. The system would therefore require transaction fees to be paid to the miners. This system would therefore require ongoing costs to support the network, however does offer a completely distributed system for communities to host a currency. This scheme may or may not be completely immutable. Bitcoin benefits from a wide geographical distribution of miners, whereas the miners of a Community Credit may all be in a certain location and possibly open to local regulatory actions. The currency conference was a bit of a learning curve for me and DLT. I came away thinking that actually blockchain technology may not be suitable for local currency initiatives. These schemes are either in “progressive” communities, where they are competing with local fiat currencies that do not have transaction fees. Raw economics indicates that individuals would be less likely to use a currency when a transaction fee is present, however small that is. The “crisis” communities are even less likely to use them. The other issue is the fluctuating value. After a couple years of using Bitcoin I am relatively happy with the concept of buying items in a fluctuating currency, however these are usually only leisure goods. You couldn’t have a serious amount of your wealth in this type of currency, not unless it was much more stable. I think local communities would struggle to convince the majority of the population to use a currency that is constantly fluctuating. To local currency schemes considering the use of blockchain-backed systems, I would issue a word of caution. Personally I would use a system like Cyclos and focus energies on ensuring a strong and transparent governance regime of the organisation managing and issuing the currency. Governance models could include cooperatives, charities or social enterprises. I would also consider publishing data, maybe daily or weekly, on the amount of local currency tokens in circulation. In this method you are actually replicating part of the strength of cryptocurrencies; their transparent blockchain structures, without requiring transaction fees. However, I will watch closely to see if any currency schemes develop that use the principles of DLT, like what is being pursued in Hull, UK. Hope this is of use. Stuart Bowles is a PhD Candidate at the University of Birmingham. He has background in sustainability, socioeconomic processes, financial innovation and social enterprise. His PhD explores the role alternative financial innovations including cryptocurrency will have in society, especially towards meeting the objectives of sustainability.